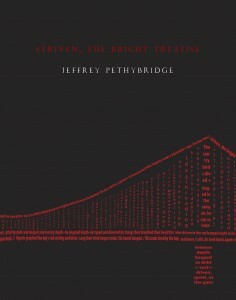 In his cunningly evolving repetitions, in his provocative use of constraints, and in his adaptations of great works (from Dante’s to David Bowie’s), Pethybridge’s Striven, The Bright Treatise exemplifies every element of Theodor Adorno’s assertion that the unresolved antagonisms of reality reappear in art in the guise of immanent problems of artistic form. It is not a book bent upon understanding, and certainly not condoning, the choice of suicide—though Pethybridge unearths many of the societal and personal antecedents of such a choice. Rather it is a text that formally explores every interstice of the zone between the irretrievable past and ongoing present, which the grammatical form of the word “striven” suggests (past participle, used in the perfect tenses). This is a poetry that helps us to perceive that interminable bridge between past and present in all of its terrible normalcy, a bridge that carries us to the core of our human condition. Jeffrey Pethybridge is the North American editor for Likestarlings, a web-based archive of collaborative poetry and poetics. His work appears widely in journals such as Chicago Review, Volt, New AmericanWriting, Crazyhorse, The Iowa Review and others. He grew up in Virginia. 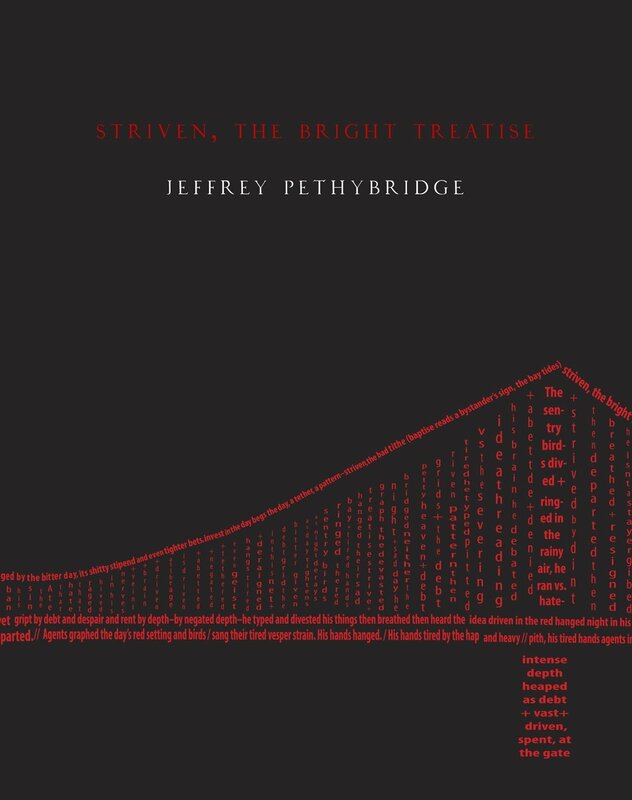 Similar to Twombley, the poems in Striven, the Bright Treatise arrive at thesis as much by visual statement as with actual words, but unlike Twombley there is a meticulous attention to wordings in Pethybridge’s work that seems more recherche than crude. Some poems are full page blocks of prose, some are scattered spaciously across pages and others more audacious as foldouts that blur the line between the act and art of writing and that of drawing.